Münster Student Services was founded more than 90 years ago as a self-help group of students helping one another, and we are still in existence today to assist students. Whenever it is a matter of finding inexpensive housing or meals, financing studies or obtaining advice about social services or childcare, we at Münster Social Services are the first address to contact. We have 5,624 units in 23 residences from which we can offer housing to students in Münster and Steinfurt for inexpensive monthly rental prices beginning at €220.90 for rent, including heating. We offer single rooms, single and double apartments as well as apartments with 2-6 rooms, all of which are located near the University. As we are the largest single provider of student housing in Münster, in general and where possible, we have the important function of maintaining stability of rental rates for student housing in the region. We offer 64% of our housing for under €250 (including heating) and a further 23% for €251 – €300 (including heating). Whether furnished, partially furnished or unfurnished, we have special housing offers for single students, couples with children and students with disabilities. All of the residences are equipped with washing machines and laundry dryers and have adequate parking for bicycles and cars available. Today high-speed access to the Internet is indispensible for academic success and so, in cooperation with an external provider, we offer our tenants widespread coverage of high-speed Internet and digital TV services. Student Services offer a totally diverse and affordable range of quality meals and snacks in five dining halls and nine bistros at 14 locations in Münster and Steinfurt. When we plan our meals, we not only consider quality criteria, nutritional value and taste, but also the environmental and social impact of the ingredients. We prepare and serve 15,000 meals a day. These range from various meal combinations, delicious stews, abundant salad and vegetable buffets to freshly grilled food and diverse desserts. We even have special stands where we cook in front of the diners (“showcooking”). In some of our dining facilities we can offer our guests meals from ingredients grown on certified organic farms, meat exclusively from animals bred and raised in an environment that is natural for the species and a number of particularly sustainable products that were manufactured in the Münster region. To round up the variety, we also offer vegan alternatives in two of our larger dining halls. The team in the office for student aid gives advice and distributes information to answer any questions students may have about financing their studies. The team processes applications for student aid through government grants and loans, BAföG, as well as applications for student financing by loans from the Student Services loan association (DaKa, Darlehenskasse der Studentenwerke). Münster Student Services has been caring for students’ children in 3 facilities for over 40 years. 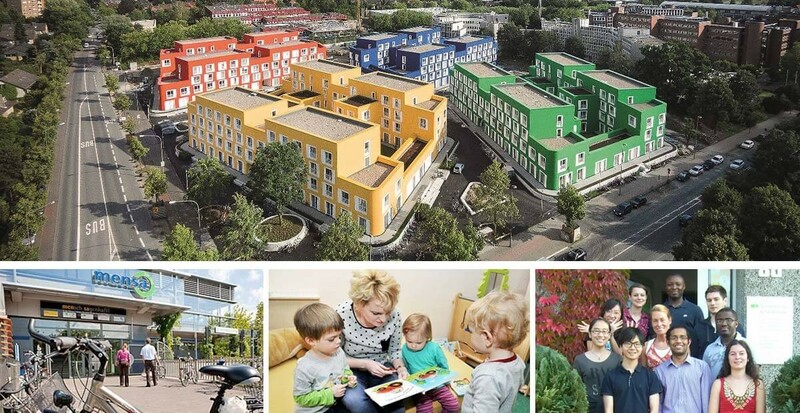 Enrolled in the daycare center “Tausendfüßler”, located at Kardinal-von-Galen-Ring 20, are 48 children of students and employees at the Münster universities and another 60 children attend the new daycare center, “Chamäleon”, at Rudolf-Harbig-Weg 38a. Flexible short-term childcare is offered for up to 12 children at “Zwergenstübchen”. To study successfully at the university these days, students especially need increased social support. This is reason enough for Münster Student Services to continually adapt the form of social, financial and even cultural assistance to refocus on students’ changing living conditions and needs. Accordingly, we expanded our services to students to include a social service counseling office, opened in 2006. The services include counseling for students beginning or ending their studies, as well as advice about student financing and housing. We can help answer questions that are specific to international students, students with children and students with disabilities or chronic illnesses. We answer general questions students may have, but also provide counseling or coaching for personal difficulties. Our social services are free of charge and held in confidence. For students of the Münster universities who do not receive BAföG and who find themselves unexpectedly and involuntary in a financial emergency, we can also arrange, among other things, short-term loans or a free dining card.